In 2023, robots known as Sentinels fight and kill the remaining mutants and the rest of the human population. 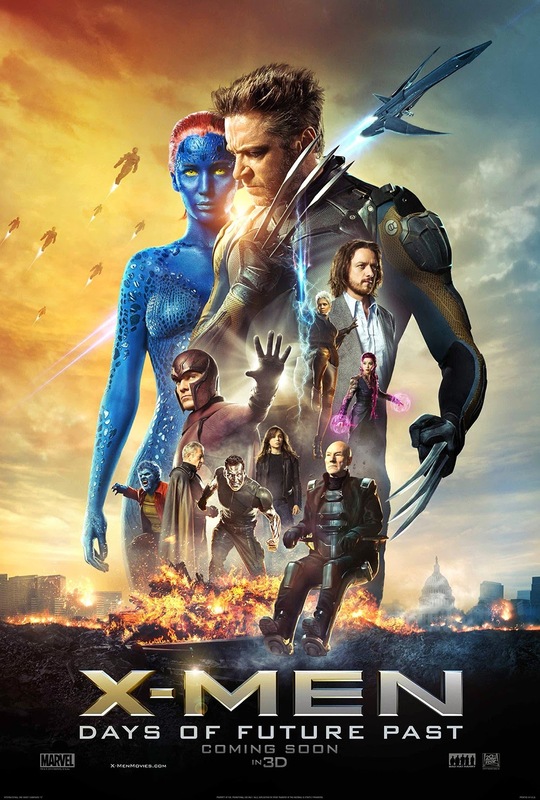 In order to prevent this from continuing, Professor X (Patrick Stewart) and Magneto (Ian McKellen) conspire to send Wolverine's (Hugh Jackman) consciousness back in time to his younger self, in order to prevent Mystique (Jennifer Lawrence) from killing the man who designed the Sentinels, which lead to a Martyr effect and the Sentinel's production. Wolverine is sent back, and meets with the younger form of Xavier (James McAvoy), telling him of the plan. With Magneto (Michael Fassbender) back on their side, and the future fate of both the human and mutant population at stake, they begin to put their plan into motion. I won't lie; from the trailers, the posters, the title and the plot descriptions, my hopes for this film were low. So low, in fact, I was convinced this film would be a disaster. But, as I work in a cinema, I took a free trip at midnight to see this, still convinced I would be unimpressed. Boy, could I have been more wrong? I'm yet to see the original four X-Men films; prior to this I had only seen First Class, which I thoroughly enjoyed. Days of Future Past, however, makes First Class look like the Teletubbies. Not only is the action close to flawless, but it never loses sight of its characters, its complex plot or its themes. This, right here, is a superhero film done to perfection. There are so many characters in this film, you'd think you'll need a pen and paper just to remember who's who. But nope. Director Bryan Singer has constructed such an intricate script that enables us to know who the main characters are, and which ones we need to focus on. But these central characters are so well written. There are some great bursts of humour littered throughout, but the emotional level is there too. When these characters give big speeches or perhaps even get emotional, it does feel necessary. It feels real. This film boasts such a stellar cast, and its so refreshing not to see a cast like this wasted. Lawrence, McAvoy and Jackman are all fantastic in their roles, but, much like First Class, this film belongs to Fassbender. He truly is one of the greatest actors of this generation, and here he showcases that with sheer power. The story itself is also incredibly well plotted. They don't take any time to get things going. We know all these characters already, we don't need an introduction. Singer skips this introduction completely, and I'm glad so. Not a minute of this film's running time is wasted; every last second is wisely spent, each more interesting and compelling than the last. It was also nice to see a superhero film empowered by strong political themes, and cleverly combine these themes with the superhero genre. The Captain America sequel attempted this earlier in the year, but failed. Captain America brought in the politics, but lost the superhero; it wound up far too big for its own boots. Days of Future Past, however, does it seamlessly. A superhero film, guided by a political background. Perfect. The superhero side of things itself is just as solid as you'd expect, too. I can't imagine how fun it must be to choreographic a multi-mutant fight, knowing that there aren't any real boundaries. We have people phasing through walls, explosions of fire, mutants turning themselves into ice, and spontaneous makeshift portals. And that's just the first scene. Whilst this is film is fundamentally driven by character and story, the action scenes are fantastic. I appreciated First Class for its relatively small scale action; there were no car chases or massive flying ships. Days of Future Past replicates this, perhaps even betters it. We don't have a setpiece as thrillingly tense as the beach finale from First Class, but Magneto's football stadium act isn't far off. Days of Future Past is unlike anything I've seen since Nolan's Dark Knight Trilogy ended. I'm aware it doesn't belong in their Cinematic Universe, but this is by far Marvel's greatest film in a very long time. I don't want to rant much more about The Winter Soldier, but this is exactly how that film should have been. Instead, it wound up as a dull, lifeless political drama that was neither action packed nor interesting enough to sustain itself. Days of Future Past shows exactly how to do it; a character driven story, boasting a great cast, supported with strong political themes, a healthy dose of action and solid visual affects. When it comes to modern superhero films, you don't get much better than this. To Summarise: Thanks to its solid action, intelligent script, strong cast and assured direction, X-Men: Days of Future Past is a powerful superhero film that is as entertaining as it is politically astute.